Can you believe Tristan is five?! WOW! Five is a big deal for me. It's the end of toddlerhood. I wasn't sad about it though (most likely due to still having another toddler in the house). We had a bit of a surprise this year when Uncle Ben and Uncle Nate came down for a visit during Tristan's birthday. Quick note. Check out the Megabus. It's ridiculously cheap and I don't know how much longer they can stay in business. I mean... $1 for a 6hr drive can't be making them money, can it? Tristan was a little sad this year because Noah had school and Daddy had work. However, that was quickly remedied with basically a three-day celebration for him. He woke up early and opened presents with Noah there, cheering him on. He did not get any live animals ;) Three wii games, new clothes (he's not your typical little boy, he looooves clothes) & a remote control car. 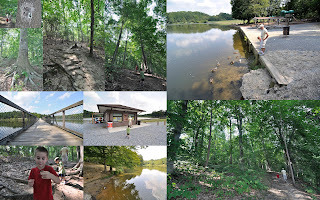 This is Gilbert Run Park. On the weekends it has paddle boat rentals and a complete concession stand. They also sell fishing licenses. The playground is impressive. The trails are well marked and a decent hike, but not too much for the kiddles.